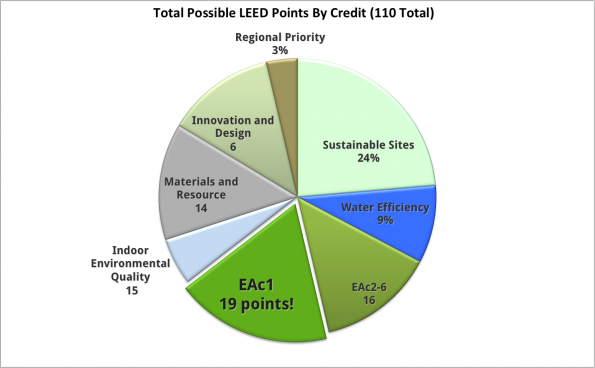 EAc1 LEED points can't fall entirely on the back of the MEP! "We have a design that is going to save 30% on energy costs annually. The HVAC has an improvement of 35% over the 90.1-2007 baseline, and we are using such and such.."
…..But then, I look at the lighting and see that it is designed at 1.2 watts/sq ft compared to a baseline building at 1.3 w/sq ft .
Now if you're asking, "what's wrong with this? "- I want to ask you, "What's wrong with you and why are you reading my blog?" Okay, maybe I'm being harsh again but it's really simple math and I shouldn't need to explain it in depth. The truth is that lights are one of the best ways to earn LEED points. What is the true extent of designing highly efficient lighting systems? Let's assume we are comparing to a baseline building that uses 1.3 w/sq ft on (whole building area method) and let's assume the whole building design averages to .84 w/sq ft. What is the savings on this? Well, most people will say, "that's easy, .46/1.3 or 35%"
However, most people forget about the additional savings that comes from lights, especially in a cooling and in heating when the heat is non-electric. Remember, lights give off heat and therefore increase the amount of cooling energy (compressor, fan, and heat rejection). So, a 35% savings on the lighting yields an effective savings of nearly 45%. Yeah, but don't the lights provide "free" heat in heating mode? Let's assume there is gas heat, electricity costs $ .10 kw-hr, and gas costs $1.00/therm (so we will do this in costs). We will also assume a 90% efficiency in heating equipment and 4000 hours of operation. So, yes, there is an offset in heating mode but there is still substantial savings as long as the heating is provided using low cost fossil fuels (relative to electricity) or if heat pumps are used in heating mode. Furthermore, most commercial buildings have a significant amount of cooling required. Remember, even in economizer mode, additional cooling means more fan energy. Several sets of data were simulated in eQUEST to see how various cities saved. 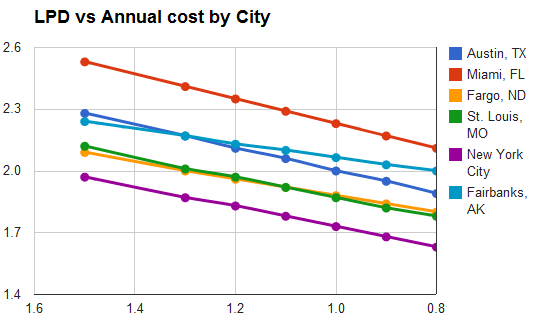 As predicted, cities with greater cooling showed the greatest savings per watt of lighting saved. It was surprising that even Fairbanks, Alaska had similar savings to climates like Miami. If additional effects, such as summer demand charges are considered, the savings would further increase! Are you a LEED AP? Do you know the ins and outs of energy-modeling? If you can answer yes to both of these questions your portfolio will be on hyper-drive. Here, we are going to outline the TRUE importance of an Energy-model in LEED certification. In fact, we'll quantify it and also answer some beginner questions if you are new to the subject. We are also going to help you decide whether to do a model in house or hire a consultant (and also help you to avoid getting ripped off if you do hire a consultant). When someone refers to LEED energy-modeling, they are almost always referring to LEED Energy and Atmosphere credit 1, and likely Energy and Atmosphere pre-requisite 2. Also refer to our "What is energy-modeling page". 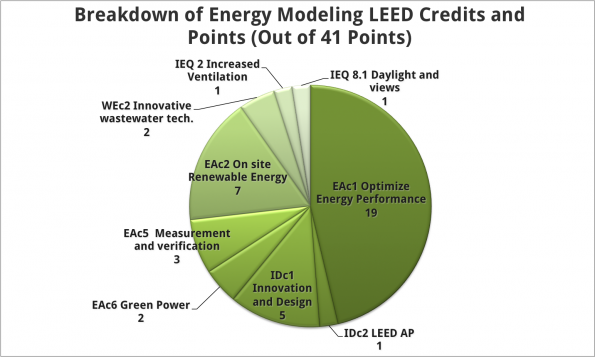 Why is it important for a LEED AP to know energy-modeling? So, if we adjust the chart and subtract these aforementioned points from their current category and move them into the energy-model's portion of the pie, we get the true extent of the LEED energy-model. So, what does our adjusted chart look like now? 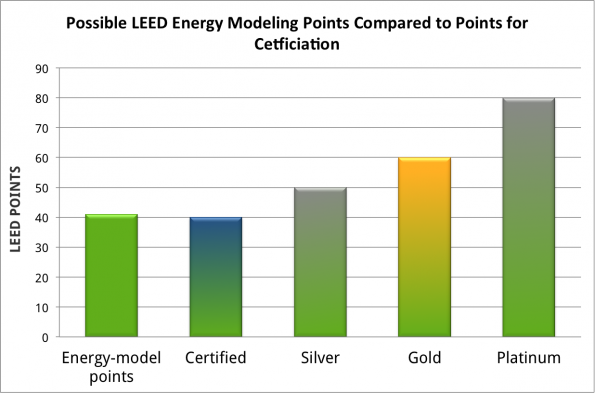 There are enough energy-modeling points to get a building LEED certified! Of course, with all the pre-requisites and complexities, we aren't recommending that anyone try this. We just wish to illustrate the importance of energy-modeling to LEED and to LEED AP's. Why will it benefit a LEED AP to learn energy-modeling? There are thousands of LEED AP's, but only a small percentage know how to create an energy-model in a legitimate software package such as TRACE 700 or eQUEST. An even smaller percentage are highly proficient. Why is this? Well, up until now, it has been easy to get LEED training, and difficult to get building simulation training. What about the prescribed path for LEED Energy and Atmosphere credit 1? 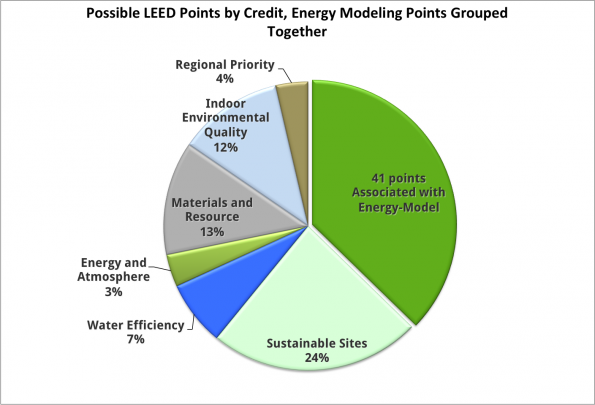 What is the cost of energy-modeling for LEED? Now, the issue of cost for energy-modeling is highly disputed. The reason it is so expensive is that very few people can create valid models within a reasonable time frame. However, a rate of 20 cents per square foot is pretty common for high end modeling (as the buildings get larger than 120,000 square feet, this number might be 10-15 cents per square foot, but if you disagree, please comment!) The LEED energy-model is often, sub-sub-sub-consulted (and maybe more), and therefore, the price is highly inflated. I would suggest working directly with an energy-modeling firm as to complete any energy-model. Given that the model may be 60% of the total LEED consulting fees, this should be a no-brainer. Instead of having 1 consultant, you may wan to consider having 2 LEED consultants: 1 for General LEED and paperwork, and 1 for the energy-model (unless you are certain that the LEED consultant is giving you a good price on the model). A good energy-modeler can save you money on your design as well. It's easy for a good energy-modeler to cut out the "fluff" saving big dollars on design. Thus, a good modeler can save the money on the design. Example: The team at energy-models.com recognized that a geothermal well might not be needed given consistent cooling and heating loads annually. We did some tests and found that the geothermal well, while 30% of the cost of the hydronic system, only added .5% additional savings. We reported our findings to a very happy, and suddenly under-budget design team.